What Does Australia Have Against Katy Perry? The answer is nothing, unless you count labeling her latest album a biohazard. Have you ever wondered why you are unable to bring certain flowers and seeds into the United States? Or why you are not able to just bring your pet monkey to Germany? Though seemingly unrelated, the answer to these questions is related to Australia’s response to Katy Perry’s latest album Prism. When Perry’s production company released the album, they included a seed packet for each customer to plant. 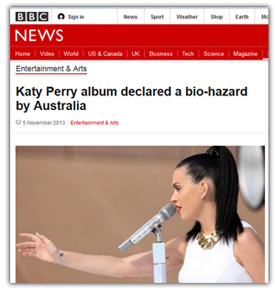 The CDs sold in Australian contained local plants native to Western Australia, but U.S. versions are cheaper and contain a seed declared a biohazard by Australia’s Department of Agriculture. But why is a seed packet, which seems so environmentally friendly, labeled a potential biohazard? The answer is simple: it could become an invasive species. An invasive species is a non-native species that could harm an ecosystem. The Department of Agriculture, by preventing the entry of foreign species, is attempting to prevent the destruction of Australia’s wide array of ecosystems. But don’t worry, Australian nationals can still purchase the Australian version of Prism. And those flowers you wanted to bring home from Holland? Totally fine, so long as you check in with United States Customs and Border Protection first! I was visiting my Mom’s house for our weekly catch­up dinner. Originally, these dinners were a way for me to avoid countless hours on the phone with her throughout the week, but eventually turned into an event that I looked forward to. Both of us being pretty big foodies, we made it a tradition to find a new interesting recipe to experiment with each time we met. This week’s recipe of choice was three bean tacos with tofu and corn salsa; yum! As we finish cooking our meal and sit down to eat I begin telling my mom that I’m in a class in which we talk about Genetically Modified Organisms (GMOs), when suddenly, mid-­sentence, I am interrupted with a deep sigh and disturbing look from her side of the table! I jump to the assumption that something is wrong with the food and immediately spit out the large first bite that I had taken (unfortunately failing to get all of it on my plate!). I ask what’s wrong and she explains that GMOs are bad. I let out a rather large chuckle (relieved that nothing is wrong with the food), and ask her what GMO stands for. Not to my surprise, she couldn’t quite come up with the meaning. I asked how she knew that she didn’t like them if she didn’t actually know what they are. She explained that she had read an article that said they were bad, and so she thinks they are bad. I wish that I was exaggerating on the simplicity. This caused an interesting revelation for me. I had formerly thought that everyone who didn’t like GMOs knew something that I didn’t, because I had never seen a problem with them. My mother made it clear for me that the “non­GMO” project may actually just be one of the most successful brainwashing attempts that American’s have experienced. 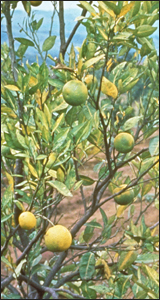 While I was searching for a new topic in the news, and with the help of Pinterest, I came across citrus greening in Texas. It is also called Huanglongbing (HLB) and it is considered the most destructive disease in Asian, Africa and in the now in North and South America. It is also known as the Yellow Dragon Disease, and this bacterium is spread by an insect. The insect carries the bacterium for the rest of its life, and the plant itself, dead or alive, including the debris and the tree itself can remain infected. . It has been found so far in Texas on orange trees. Unfortunately there is little information on this disease since it has just recently affected Texas, as well as a few other southern states. 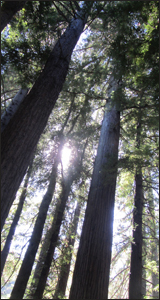 Large trees are vanishing from the Californian wilderness at alarming rates of between 55-75 percent. There are various causes that can be linked to this phenomenon. These are intense wildfires, lack of water, and rising temperatures. These three changes are having an immense impact on wildlife in California. Rising temperatures and lack of water are linked, causing earlier snowmelt and the loss of water to precipitation in the air. The older trees that occupy the forest grew and developed in the colder climates that were normal decades ago. Now that the climate is becoming increasingly warmer, the trees are finding it harder and harder to survive. However, despite the decline in the older trees, we are seeing a new abundance arising in the form of oak trees. Oak trees thrive in hotter, drier climates which makes the rising temperatures of California a perfect place for them to set up shop. Along with these, scientists are observing an increasing number of smaller trees and shrubs that are flourishing in these regions. Forests once dominated by impressive large trees are being overcome by smaller trees that require less water. We must ask ourselves, how will the California drought continue to affect these forests, and will we eventually lose the majestic picturesque forest that we knew? Soybean growers want to have a better yield this year! But, how? For every grower, the most critical question is how many bushels per acre of yield can be produced this year? There are several ways that can be practiced to obtain a greater yield, however it is not always 100 percent guaranteed that things would turn out well. 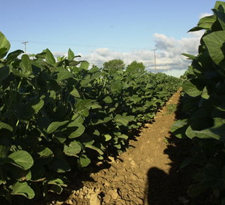 1) If possible, select disease resistant variety like (soybean aphid resistant variety and soybean cyst nematode resistant variety). Planting resistant varieties can help reduce the damage on the crop by pathogen. Growers should determine what diseases and other pests they have in their field to determine what resistant varieties would be recommended for their field, soil type, etc. 2) Early planting is recommended. There can be yield losses up to one bushel per acre per day if planting is beyond May 10. 3) Narrow row spacing. It is recommended to plant a 15 inch row spacing rather than a 30 inch row spacing. Narrow row spacing not only helps to avoid the growth of weeds, but also increases light interception between soybean plants, which then promotes better growth. 4) Weed control. In order to avoid yield loss, it is important to keep the field weed free for the first four weeks after soybean crop has emerged. 5) Apply fertilizer when needed. Both macronutrients and micronutrients are significant in crop growth. Diagnose the deficiency symptoms correctly, and apply the right amount of nutrients. I find this topic interesting because if I have to plant soybean crop for living, I want to make sure I can acquire the maximum yield from my crop. I deserve to earn the greatest profit from the effort I put in it. Also, yield increase will benefit consumer since there will be sufficient amount of food for everyone.